Last updated 16 August 2018 . By Hannah Barnes. Combining a cutting edge VR golf experience with a MasterChef-semi-finalist crafted menu, The Range is unlike anything else in the city. Arriving in Manchester eight months ago, The Range promises fine fayre with a side of high tech golfing. Popular with the lunch time crowd - spilling from their Spinningfields offices - and foodies alike, this venue offers something completely new to the city. Whether you’re a golfer yourself, or simply want a taste of the Albatross & Arnold restaurant menu, which sits alongside the clubhouse, you won’t be disappointed. The decor does pared down luxe beautifully and the menu itself is just as elegant, with Masterchef semi-finalist Jonathan Green knocking up fine-dining dishes. Seasonally changing and lovingly curated, plates can be ordered as you fancy or as a tasting menu - as the chef intended, with or without pairing wines. My partner and I opted to test out a few things of our own choosing, but would certainly go back for the full event. To start with I chose the cauliflower which consisted of a crispy potato skin, filled with cauliflower custard, cauliflower two more ways (which I won’t give away) and pickles. This was one of the most delightful dishes I’ve ever encountered - which is no surprise, due to its MasterChef credentials. My partner chose the hand-dived scallops; a fresh and simple dish which was beautifully displayed in a clam shell. For the main event we both chose a meat dish; Confit Lamb Shoulder & 42-Day Dry-Aged Beef Fillet, although both the fish and vegetarian options looked just as alluring. My lamb was excellent, plated alongside crispy lamb breast and charred greens and beautifully accented by the accompanying red wine, chosen by the waitress to complement my meal. The beef was equally as mouthwatering, blanketed in a rich red berry sauce which was decadently moreish. 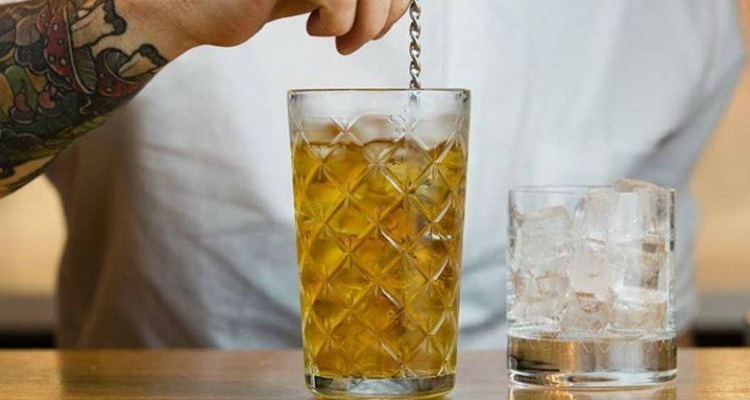 It doesn't matter if your game isn't strong; The Range will knock it out of the park with top-notch cocktails and food. We decided to also opt for desserts, what’s dinner without dessert after all? We shared the Chocolate & Espresso Fondant and the Summer Berry Crumble. The fondant was perfection; just the right amount of ooze in the middle with a good hit of coffee. The Summer Berry Crumble was a lighter, more summery dish and came deconstructed on the plate with the ideal ratio of crumble to fruit and made a lovely end of meal palette cleanser. We rounded everything of with...well, a round of golf! And thanks to The Range’s high spec simulators, we didn’t even need to leave the building, as we travelled from hole to hole, without the walk. With over 100 different courses, the venue is a great excuse for avid golfers to try out their swing - every timed we whacked the ball, it was immediately noted on the electronic scoring system. Continuing the relaxed contemporary vibe, the club house is a seriously cool space to catch up with colleagues or just work on your game. 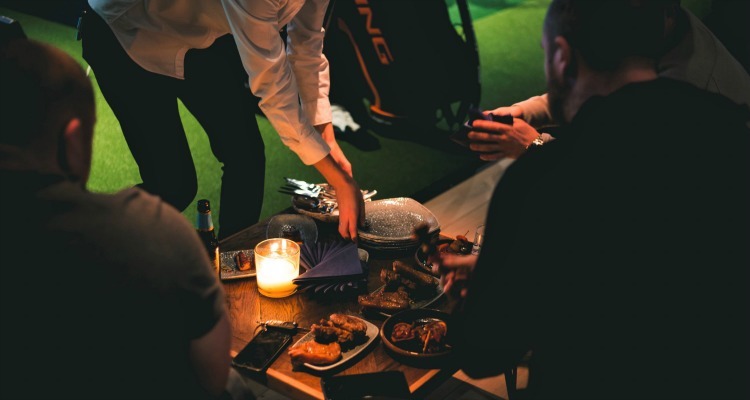 The Range is a completely new experience; offering avid golfers the chance to hone their skills alongside a menu and dining experience to rival some of the best restaurants in the city - a true hole in one. Eater, Writer and CoFounder of The Crimson Wave Org. Based in Manchester. Tweeting from @hannahattheloft.